Get everything you need to start anew with this 28 volt hammer drill kit from Milwaukee. Two M28 REDLITHIUM batteries are included, each of which will deliver up to twice the running time of an 18 volt battery. Providing 750 in. lbs. of maximum torque, the lithium-ion powered hammer drill enables operators to drill sizable holes or drive large screws with greater ease and efficiency. This heavy-duty tool produces up to 1800 RPM with a lower speed setting (0-450 RPM) for more delicate jobs. Use the soft-grip, non-slip side handle for maximum command and leverage. See why professionals rely on Milwaukee for superior performance and durability. 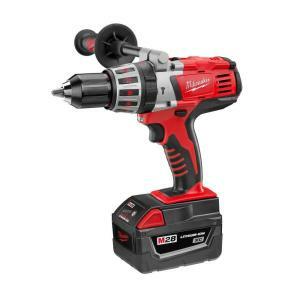 Tbook.com crawls the web to find the best prices and availability on Hammer Drills and related Tools and Hardware products like Milwaukee M28 28-Volt Lithium-Ion Cordless 1/2 inch Hammer Drill Kit w/(2) 3.0Ah Batteries and Charger. For this page, related items include products we find that match the following keywords: "Hammer Drill" at our vendor partner Home Depot. Milwaukee M28 28-Volt Lithium-Ion Cordless 1/2 inch Hammer Drill Kit w/(2) 3.0Ah Batteries and Charger is one of 148 Hammer Drills and related products listed in the Tools and Hardware section of Tbook.com If you have any questions on this product, please give us a call at 734-971-1210 during the hours of 9am - 5pm EST for assistance. Thank you for shopping at Tbook.com, the Internet Department Store!